A basking lamp for day-active species. Creates a local hot spot for basking species. 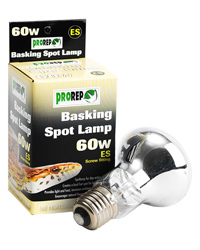 60W Standard R80 format clear reflector spot bulb. These bulbs seem ok I've had the odd one not last too long in the past but all in all happy to purchase again when needed.